Ukraine's main opposition leader and presidential candidate has said he has survived an assassination attempt. Viktor Yushchenko was travelling in the south of the country during an election tour when, it is claimed, a lorry tried to force his vehicle off the road. Car crashes are common in the former Soviet republic - around 1,000 people die on its roads every year. In recent years, a number of politicians have been killed or injured in traffic accidents. 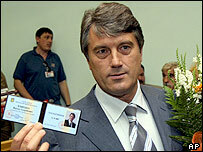 Mr Yushchenko claims what happened to him was no accident. His team has said that the day before the incident they had a tip-off that someone would try to kill the presidential candidate in a traffic accident. Mr Yushchenko said the car in which he was travelling on Thursday tried to overtake a lorry three times, but on each occasion the lorry swerved towards his vehicle. The former prime minister had been travelling in Kherson in southern Ukraine as part of a campaign tour of the country. Mr Yushchenko is currently leading the opinion polls as the favoured candidate to win the presidential election in October. The roads in Ukraine are generally in a poor condition, but some accidents involving powerful people have aroused suspicions. In 1999, a dissident and prominent politician, Vyacheslav Chornovil, was killed when the same type of lorry pulled out in front of his car and a couple of years ago, another leading opposition figure, Yulia Tymoshenko, was injured in a head-on collision.